One momentous night in Berlin, three women working in a coat room struggle for reproductive choices better than just the neoliberal freedom to have them. 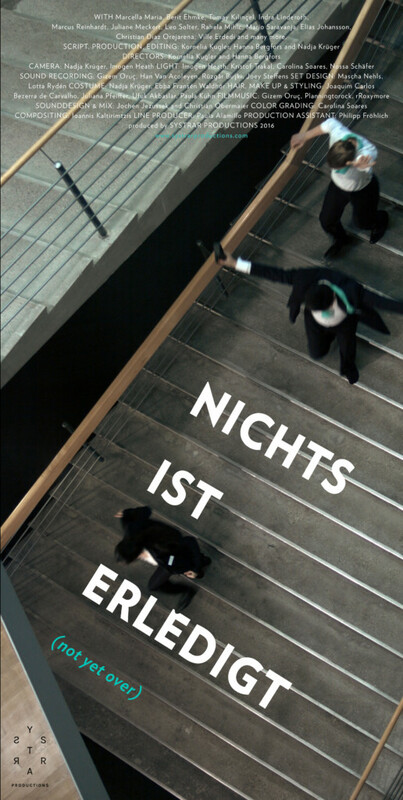 Nichts ist erledigt/Not Yet Over, a multi-genre fiction film, incites us to look at feminism’s™ unfinished business from the bottom up. While corporate feminists laud the liberation made possible by new reproductive technologies at a conference for elites, the film captures three women working behind the scenes as they negotiate their choices around reproduction. Ewa wants an abortion. Maria wants artificial insemination. Selma wants to earn money as a surrogate mother. The protagonists eventually encounter one another doing a very different kind of reproductive work, as service staff at the conference. Interspersed in the film are scenes of a pro-life rally, a birth, and a technofeminist speaker preaching the merits of egg freezing and surrogacy. The latter is on a political collision course with our protagonists, yet their paths never cross. But Ewa, Maria, and Selma do catch a glimpse of solidarity in the back of the coat room. Our aim was to make a fiction with strong, complex female characters that deals with the relationship between the possibilities and limits of reproduction, both technologically and socio-politically. We wanted to look at the current relevance of a classic call to arms by Marxist feminist theorist Silvia Federici, “Wages Against Housework” (1975), by relocating its demands in today’s landscape of fast-paced technological change and increasing precarity. While the film takes place in Germany, it treads on international ground because of its negotiation of motherhood and feminized labor in times of neoliberal uncertainty. Nichts ist erledigt / Not Yet Over is thus not a film for or against motherhood, but rather an essay on the conditions of reproduction today. We developed the script around the antagonism between Maria, who wants to have a child, and Ewa, who doesn’t. The younger figure of Selma serves as a joker, mediator, and instigator, galvanizing the conflict between the two women. In the end, they find a collective voice together in the coat room to counter that of our conference speaker and the kind of corporate liberal feminism she represents onstage. While she preaches the cult of “having it all” to a crowd of enraptured elites, she overlooks at whose expense that ‘all’ comes. On the contrary, as our film title proclaims, we think that there is still a lot to be done. CAST: Marcella Maria, Berit Ehmke, Tümay Kılınçel, Indra Linderoth, Marcus Reinhardt, Juliane Meckert, Leo Solter, Rahela Mihic, Mario Saravanja, Elias Johansson, Christian Diaz Orejarena, Cavo Kernich, Yannick Spiess, Ville Erdedi, Jule Köhler, Lotta Rydén, Thomas Wilke, Rodrigo Garcia Alves, Liz Rosenfeld, Vedrana Madžar, Boris Doris Azemar, Cary Cronenwett and many more.